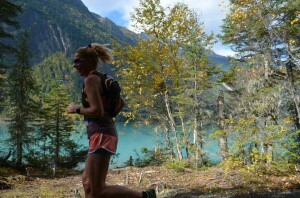 The half marathon takes racers along the Robson River to the shores of Kinney Lake. 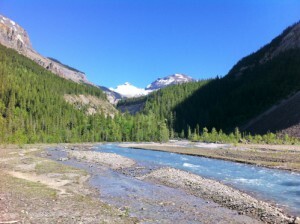 The turn-around point is on a broad outflow plain below the towering slopes of Mount Robson. Although runners will be halfway to Berg Lake, they will encounter less than 1/4 of the elevation gain of the full marathoners. 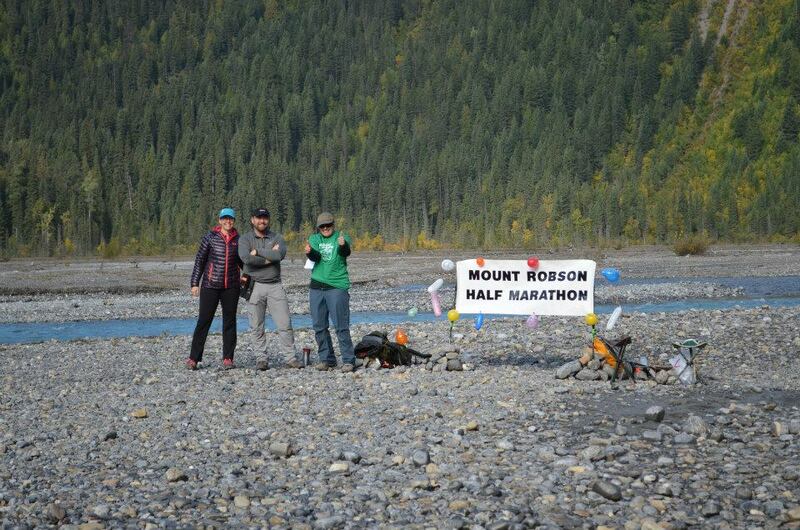 Volunteers at the half marathon turn-around point on Kinney Lake flats. 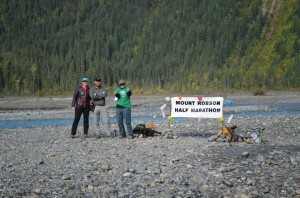 The half marathon takes runners up the Robson River past Kinney Lake to the flats where the river drains into the lake. Whitehorn peak is visible from the flats. The route winds around the turquoise water of Kinney Lake. 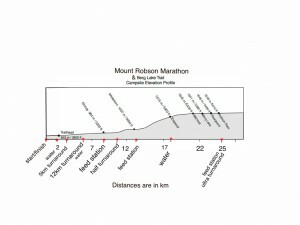 The half marathon has an elevation gain of about 180m/600ft over the 10.55km distance to the turn-around point. Most of the elevation gain is spread evenly along the 4km between the Berg Lake Trailhead and Kinney Lake. There are only two short sections (perhaps 200m each) of what could be considered steep uphill. The Berg Lake Trail is the most heavily used backcountry trail in the Canadian Rockies, with over 2,000 overnight users each year. The trail is very well maintained, and is mostly hardpacked ground with very few exposed roots or protruding rocks. 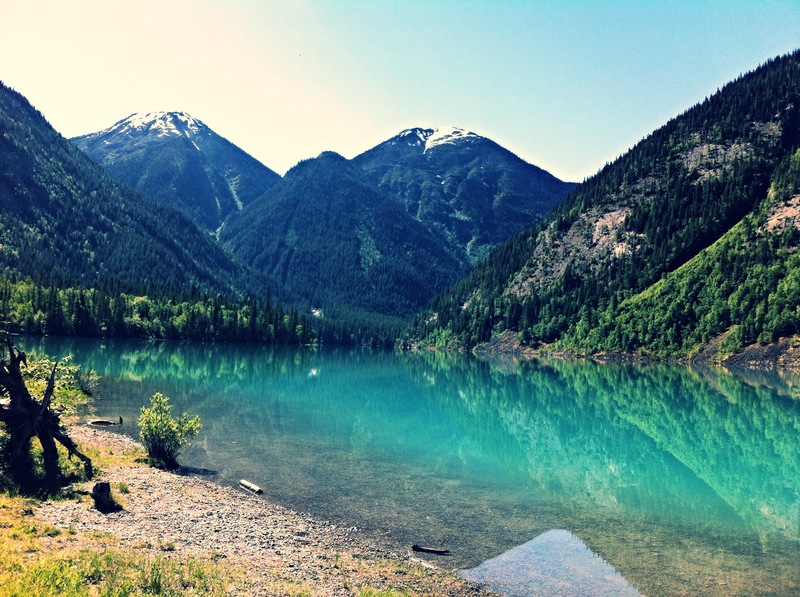 • The Kinney Lake aid station (located just before and after the half-way point) will be supplied with: water, Gatorade, cut up energy bars (Vega and Clif), and energy gels (E-Load and Clif). The Finish line aid station will have chocolate milk, cut up fruit, cookies, chips, Gatorade and water. Other aid stations at the Outflow Bridge and Trailhead will have water and Gatorade. 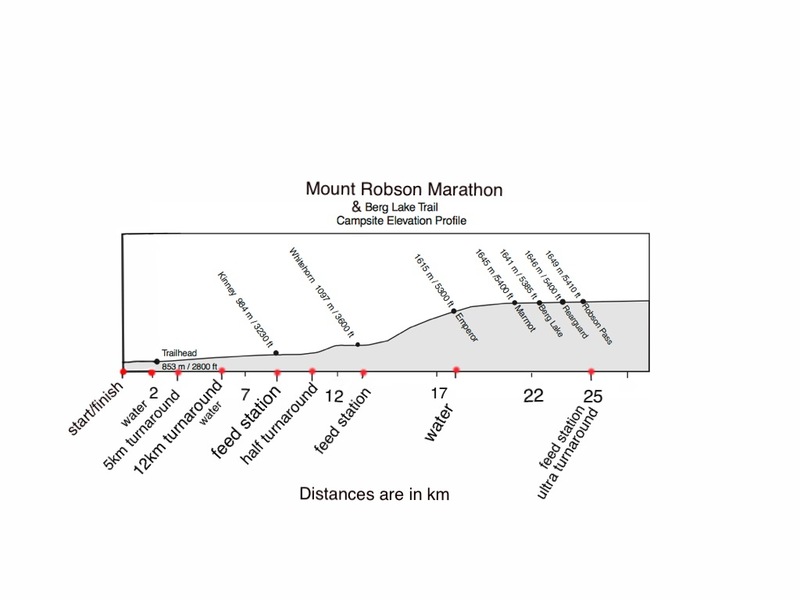 Course profile and distances – click on the image to see an enlarged version.